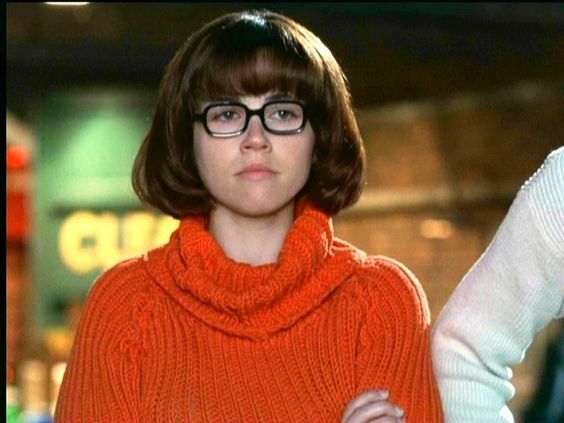 Linda Cardellini (Cassie in BBM) also played Velma in the Scooby Doo movie. That's her in the pic above. I never did get an answer to the question I asked on the first page. That is, what did the exchange mean -- Alma Jr. saying "Maybe he's not the marrying kind" and Cassie saying "You don't say much but you get your point across." Yaadpyar's "the point is that Alma Jr. doesn't think much of Cassie and certainly has no personal affection for her, but if her dad is going to marry, she (Alma Jr.) won't get in the way" doesn't really answer what I was asking. Not that it's wrong; obviously on the surface it's something like that. So the question is, what did Alma know? Is this supposed to be a throwaway scene, as simple as Cassie digging for answers via girltalk and Alma semi-dodging them -- and only the audience being in on the other meaning, like ha ha that's for sure? Or does it mean that Alma Jr. gets that meaning, too -- that she secretly knows more than she's letting on (a possibility revisited in the trailer scene at the end)? And although Cassie doesn't fully get that second meaning, the weird way she phrases the reply, "you get your point across" is interesting. On the surface, Alma Jr. didn't really have a "point" -- she's just speculating about Ennis' intentions and states them quite clearly. Cassie might as easily have said something like "We'll see about that," or "Well, I hope I can be the one who changes his mind" or "You don't think so, hunh?" But then the scene would have been simple and obvious. If Cassie had said, "I get what you're saying -- he's gay" obviously that wouldn't have worked, either. She didn't really get that. But the way Cassie replies gives the line more significance and mystery. This movie doesn't have a lot of simple or obvious scenes. I hope to come back to this later. For now I just want to throw in this reference. THanks for that, Chuck! I'm behind on my Scooby Doo movies. I agree that Junior's "not the marrying kind" can be either: (1) just that; or (2) code for gay. Then Cassie says "you don't think so, or you don't think I'm the one?" Then Junior says, "you're good enough". Cassie's "you don't say much but you get your point across" I believe, is a direct response to Junior's somewhat snarky "you're good enough" comment, and not responding directly to the "marrying kind" comment. Cuz Junior says "sorry, didn't mean to be rude". I think Junior knows about her father, and poor Cassie is clueless, but thinking more of herself here. Not sayin' I'm right, here, but has anyone given any thought to how Alma Jr.'s experience of observing and living through her parents' break-up might play into her response to Cassie? I don't know; it's just a thought that crossed my mind while I was eating my lunch. Even though he did that she still wanted him to call. She had been between men for almost two months when Ennis had come along, and she didn’t waste any time letting him know that she was interested. Didn’t tell him everything though. There were steps you had to take, she knew that...knew what the steps were, and how to follow them, in what order, when to slow down, and when to outright stop. She was at step number three, meet the kids. So far, she’d only met the oldest...at least she got to drink wine while she listened to her complain, and throw sad looks at her daddy. Well, she was almost grown and on her own. Yeah, even though he did that, she still wanted him to call...he was easy with her, mostly...she was even kinda starting to like it...which reminded her...she tossed the KY in her cart and kept on going. Ohhh. I should probably consult my BBM S2S after 12 f'in years. You're right -- given those in-between lines I forgot about, your explanation makes perfect sense. I still think in reality (reality! ) Cassie might have responded differently: "We'll see, I guess" or "I hope so" or "Cause I'd sure like to get to know you better" or "What do you mean by that?" or whatever. Something a little warmer or more curious. The fact that she doesn't, that she instead says the slightly ambiguous "you get your point across" when Alma Jr. actually DOES have an alternate point, makes the scene more nuanced. I agree that Cassie didn't get the "he's gay" subtext, but the line is interesting enough to get us discussing it 12 f'in years later.